Over three hundred people are dead and more than 2,500 injured after a magnitude 7.3 earthquake hit Iran and Iraq on Sunday (November 12). TEHERAN/BAGHDAD • A woman and her baby were pulled out alive from the rubble yesterday in Sarpol-e Zahab, the Iranian county that was worst hit in an earthquake the previous night, but the authorities were bracing themselves for the death toll of more than 400 to go up as rescuers dug through devastated buildings. The earthquake had its epicentre close to the main border crossing between Iraq and Iran. It occurred at a relatively shallow depth of 23km along a 1,500km fault line between the Arabian and Eurasian tectonic plates, a belt extending through western Iran and into north-eastern Iraq. Electricity and water were cut off in several Iranian and Iraqi cities, and fears of aftershocks sent thousands of people in both countries out into the streets and parks in cold weather. Iranian state TV aired footage of damaged buildings, vehicles under rubble and wounded people wrapped in blankets. Mr Hojjat Gharibian was one of hundreds of homeless Iranian survivors who huddled with their families amid the cold in Qasr-e Shirin. "My two children were sleeping when the house started to collapse because of the quake. I took them and ran to the street. We spent hours in the street until aid workers moved us into a school building," Mr Gharibian said by telephone. Iran's supreme leader Ayatollah Ali Khamenei ordered the government and armed forces to mobilise "all their means" to help the population. President Hassan Rouhani was expected to visit the Kermanshah province, in which Sarpol-e Zahab is situated, according to TV news reports. Local media reported that hundreds of ambulances and dozens of army helicopters were mobilised for rescue operations, including in rural areas. Iran's police, the elite Revolutionary Guards and its affiliated Basij militia forces were dispatched to quake-hit areas overnight, state TV reported. Tempers frayed as the search went on for survivors amid collapsed buildings. "We need a shelter," a middle-aged man in Sarpol-e Zahab told state TV. "Where is the aid? Where is the help?" His family could not spend another night outside in the cold weather, he said. 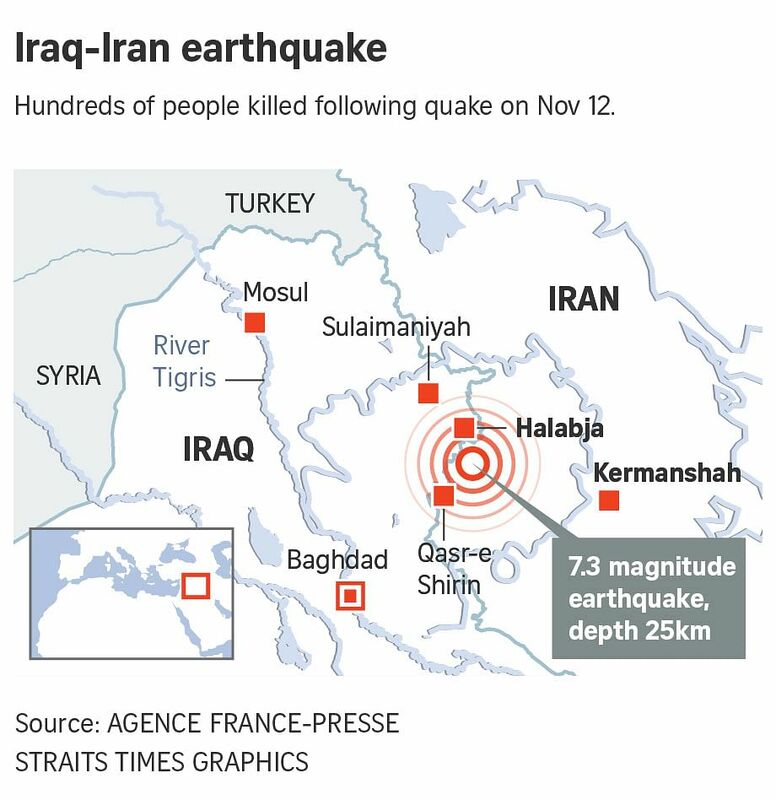 In Iraq, the quake was felt as far south as Baghdad, where many residents rushed out of houses and tall buildings when tremors shook the Iraqi capital. "I was sitting with my kids having dinner and, suddenly, the building was just dancing in the air," said Ms Majida Ameer, who ran out of her apartment building in the capital's Salihiya district with her three children. "I thought at first that it was a huge bomb. But then I heard everyone around me screaming, 'Earthquake!' "
Similar scenes unfolded in Erbil, the capital of the Kurdistan Region, and across other cities in northern Iraq, close to the quake's epicentre. Iraqi health and local officials said the worst-hit area was Darbandikhan district, near the border with Iran, where at least 10 houses had collapsed and the district's only hospital was severely damaged. Mr Akram Wali, 50, said many families in Darbandikhan sought shelter with relatives outside the town. They fled as the authorities in Iraqi Kurdistan called on people in the southern area of the town to leave their homes, fearing that the Darbandikhan dam would burst. Sunday's quake was also felt in south-eastern Turkey and Israel. The area where it struck sees frequent seismic activity. In 1990, a 7.4-magnitude quake near the Caspian Sea in northern Iran killed 40,000 people, left 300,000 more injured and half a million homeless. Within seconds, the quake reduced dozens of towns and nearly 2,000 villages to rubble. Thirteen years later, a catastrophic quake struck the ancient south-east Iranian city of Bam, famed for its mud brick buildings, killing at least 31,000 people and flattening swathes of the city.